As my first effort to post more general training advice, I am going to discuss the training plan I designed for my spring marathon training, which is based on: 1) Arthur Lydiard’s training system; 2) Dr. Phil Maffetone’s “180 Formula;” and 3) input based on the strengths and weaknesses of my fall racing season. This plan targets the Inaugural Queens Marathon. This is the first post in a series of posts about this training plan. As an initial matter, in order to discuss the plan I need to provide some background about the Lydiard System, Maffetone’s training philosophy, and how I’ve adopted them to my own training. Further, because Lydiard’s overall training plan contains five phases, this post will address why I adopted this plan, and subsequent posts will address each phase of the plan. Lydiard (July 6, 1917-December 11, 2004, born Auckland, New Zealand), trained Olympic medalists Murray Halberg (Gold, 5000 meters, 1960 Olympics), Peter Snell (Gold, 800 meters, 1960 Olympics, Gold, 800 and 1500 meters, 1964 Olympics), and Barry Magee (Gold, Marathon, 1960 Olympics). He revolutionized endurance training with his phased training plan. This “periodization” has become the basis of most modern training programs. To learn more about his life and his system, check out this link. The goal of the plan (and why I find it so intriguing) is to allow a runner to hit peak fitness and performance at his goal race. Maffetone, a doctor of chiropractic, was one of the first coaches to employ heart rate monitors in training endurance athletes. He trained, among others, Mark Allen, the six-time Ironman World Championship winner. He champions a training system in which endurance athletes perform most of their training at or below their “maximum aerobic heart rate,” a number determined by Maffetone’s “180 Formula,” by which a runner subtracts his age from 180 and then adjusts for other factors such as injury, illness, and experience. Such running is generally well below one’s fastest speeds. For example, at my maximum heart rate as determined by the 180 Formula (144 beats per minute), I can run at a top speed of 7:00/Mile, but can currently run a 5k at a 5:43/Mile pace. Ultimately, Maffetone would have an athlete train at or below this maximum aerobic pace until his development plateaus, at which point he would incorporate anaerobic training for a period of no longer than 5 weeks. He would also have any athlete beginning to use his system to train at or below his maximum aerobic heart for at least three months (and preferably up to six months) before incorporating any strength training or anaerobic workouts. He also advocates other adaptations for athletes, including eating a diet high in healthy fats balanced with complex carbohydrates. As I’ve discussed, I ran well this fall, and PR’d at the half marathon and marathon distances. While I found that my aerobic fitness was solid throughout the season, I felt that my muscle endurance (how long the muscles can tolerate the pounding impact of road racing) was lacking. So, I wanted to incorporate more miles and longer long runs early in the training season to improve my muscle endurance. I found my goal marathon, the Inaugural Queens Marathon, which is set for April 30, 2016. To see the plan laid out, check out my Training Plan. In my next post, I’ll discuss Phase 1: Aerobic Base Training, including why it’s important and how it fits into the overall plan. Hard to believe I last posted on December 8! I don’t have a good reason for the delay between posts. Essentially, after the NYRR NYC 60k, I began to reflect on what I want to accomplish with this blog. When I started it in August, I knew that I wanted to write about my running, but had not developed the idea much beyond that. I started by posting about particular training runs I was doing, workouts I attended, and then branched out into race previews and recaps. After a few months, though, I hit a writing wall: What to do next? Getting in some stair running with November Project NYC in December! That wall, unsurprisingly, coincided with the end of the fall racing season, a season during which I pushed myself and ran my first 10-miler (1:00:20), set PRs in the half marathon (1:20:51) and marathon (2:57:56), and ran my first ultra, the 60k, in under 5 hours (4:55:55), all within less than two months. I knew that my body needed a break; I did not realize my brain did, too. Hence, only a handful of posts since the 60k and now. All this to say, I’m back! Expect updates concerning my training, but with a more global twist. Expect some posts about nutrition and other fun things I’m up to, such as the Road Runners Club of America coaching certification course that I’m taking in May. And get excited for race previews and recaps for the races I’m planning to run this winter and spring. I might also write more about some of the running books I’ve read lately (more on those below). My goal is to make this blog a spot for people to pick up tips and tricks to achieve their own running goals. Crushing 10+ miles with NYRR’s virtual training crew! Thankfully, the time away from hard running and the blog has reenergized me. Regarding training, I began the base building phase of spring marathon training in earnest at the beginning of December, and will likely run the Inaugural Queens Marathon on April 30, 2016. I spent approximately two months running long runs at an aerobic pace, throwing in some strides at the end of the runs, as well as tempo runs (for example, a 5k at 6:00/mile) and progression runs below lactate threshold. I pushed my weekly mileage up from 30 miles to 50-55, and am hoping to increase to 60-65. I’ve also been riding my bike indoors on my bike rollers at least once a week, and hitting the pool (though not as frequently as I would like). In the middle of all that, I ran an unofficial 5k in 17:45 (5:43/mile), and PR’d on the tricky November Project NYC 3.4 mile PR course with a time of 20:36 (6:03/mile). As of yesterday, I ended the aerobic base training phase of my marathon training and began the hill/leg speed phase as per Arthur Lydiard’s basic training scheme. Not bad for two months. As for the blog and writing about running, I’ve read a bunch of running-related books these past two months. My friend Katherine loaned me “A Race Like No Other” by Liz Robbins (about the 2007 NYC Marathon) and The Oatmeal’s “The Terrible and Wonderful Reasons Why I Run Long Distances.” I also read “2 Hours” by Ed Caesar, a book chronicling professional marathoners’ journey to break the elusive 120-minute marathon barrier (current world record is 2:02:57 run by Dennis Kimetto at the 2014 Berlin Marathon). I also read “Running Ransom Road” by Caleb Daniloff, a powerful story about a recovering alcoholic who sought closure on his past by running marathons and other road races in locations where he was active in his alcoholism. Getting in a solid 11.5 miles with Liysa, Laura Ann, and Raul during the blizzard this past weekend! And finally, I’m almost done with “First You Run, Then You Walk” by Tom Hart, my friend Patrick’s father. “First You Run” is a collection of essays written by Hart, a former high school English teacher, who picked up running at age 31 after he quit smoking. He ran into his 60s, at which time he was diagnosed with lung cancer and had one of his lungs removed, rendering him unable to run continuously for more than a few minutes. His essays discuss a range of topics: running a sub-5 mile, running 37 miles on his 37th birthday, chasing age-group awards as a 60-year-old veteran, and eventually breaking 12 minutes for one mile while running with one lung. What makes the book so amazing, though, is Hart’s meditative writing style and honesty. Every other page I find myself thinking, “Yep, that’s exactly how I think about running.” He gets it. And in other news, I had a nice Christmas with my family and my girlfriend’s family, was able to travel to Vermont for a few days over the holidays, and have been working and preparing for the spring racing season. Life is good. Good morning! I’m in week 2 of aerobic base-building for winter and spring races. I logged just over 33 miles during week 1, most done at a moderate, aerobic pace. My aerobic fitness, as determined by the MAF test I performed yesterday, seems strong, but I’m hoping to improve it a bit before I really pick up the pace this spring. Of course, despite knowing the importance of keeping the pace easy during a base-building period, I sometimes get carried away. I’ve read warnings from some coaches that any anaerobic running during a base phase can jeopardize a runner’s aerobic fitness. I’ve also read plenty of guides that encourage fast running at all stages of training. Ultimately, however, the occasional hard run, performed whenever in my training, has not had a negative effect on my overall fitness and speed. So, while I will perform most of my runs at an aerobic pace for the next two months, I’m fine with occasionally picking up the pace, and can justify it by working on leg speed and negative splits. Anyway, after Myles peeled off at Engineer’s Gate, I kept on rolling at the same pace, slightly faster than my normal moderate run. Everything felt good as I cruised up Harlem Hill, easing up so as not to spike my heart rate. About halfway up the hill, a guy with grayish hair, blue shirt and black running pants blew past me. I checked my heart rate: 138. Way too slow! I picked up the pace, shortened my stride on the downhill, and kept a steady state over the next two mini hills. The other guy kept a solid pace, but I slowly crept closer to him. As we descended the second mini hill, I came even with him. “This is quite an effort for six in the morning, ain’t it?” He joked in his British accent. I agreed, and we ran together for a bit. He was in town for business, and had gotten up to run because, for him, it was basically 11:30 a.m. and he couldn’t sleep anymore. He was getting in a training run for a Boxing Day race, which, in my opinion, isn’t a real holiday (note: I know I know, it totally is . . . no offense, Rest of the World). We picked up the pace down the final mini hill, and cruised along past the Lake near 75th Street. “How much farther is it to Columbus Circle?” He asked me. “About three-quarters of a mile,” I replied. “OK. I’m gonna give it a bit of a sprint the rest of the way, then,” he said, and he picked up his pace enough that I noticed my breathing change. I understood his implicit challenge, and kept stride with him. I said I’d run with him until we got to my exit at 72nd Street, but quickly decided to push it all the way to Columbus Circle. He smiled and said, “Good!” We pounded the pavement and continuously ran faster. I breathed harder and turned my legs over faster than him (he had a slow cadence). We passed the finish line area of the NYC Marathon, and I pointed it out. He grunted in agreement. We were in the zone. Just a quarter mile left to the Columbus Circle exit. I pushed the pace. He followed. I pushed a little harder. He pulled slightly in front of me. I got on my toes and dug in, pushing hard but not quite all out. He maintained. I dug in harder. He relented, and I finished up about four seconds before he did. I never got his name, but we shook hands, and I wished him a good trip and good luck on Boxing Day. He smiled. We each took a moment to catch our breath, and then I jogged home. Most runs aren’t that exciting, or that random, but I’m glad when they happen. And that impromptu race at the end? I truly believe it’s not about who finishes first, but rather about the spirit of competition, and accepting challenges as they come. I might be shaking my head if he beat me, but I know I would have had just as much fun. Anyone else have stories of making random friends/competitors during a routine training run? 1) Respect the distance. The most important lesson. After the NYC Marathon, I thought that running a race only 11 miles longer would be simple. I ran strong throughout the 60k, but slowed toward the end and got passed by two runners I had outrun for 34 miles. If I reran this race, I would reduce my early race pace by about 5-10 seconds/mile, and run hard the last two loops. 2) Fuel early and often. Many ultrarunners eat about 240-340 calories/hour. I followed this plan, eating two GU gels (100 calories each) and either a banana (~100 calories) or a bag of pretzels (~120 calories) every hour. Further, I began my GU gel intake after the fifth mile, about 2-3 miles earlier than I had my first gel during the NYC Marathon. This likely helped me maintain an early steady state. I did not hit the wall. 3) Muscle endurance. I felt very confident about my aerobic fitness before the NYC Marathon and the 60k. I have consistently espoused my love of the Maffetone Method and its emphasis on developing the aerobic system. That said, prior to the 60k my long runs included a 20-miler, 22-miler, and the marathon. These runs provided a solid, but not ideal, base for running an ultra. To see how experienced ultrarunners recommend a rookie ultrarunner to train, check out the Ultra Ladies 50k (31 miles) training plan. The main differences between 50k/60k and marathon training are the long runs followed by a second long-ish run. This training allows the body to develop the muscle endurance necessary to run harder, longer. Without that type of training, aerobic fitness only takes you so far. 4) Pain is inevitable. 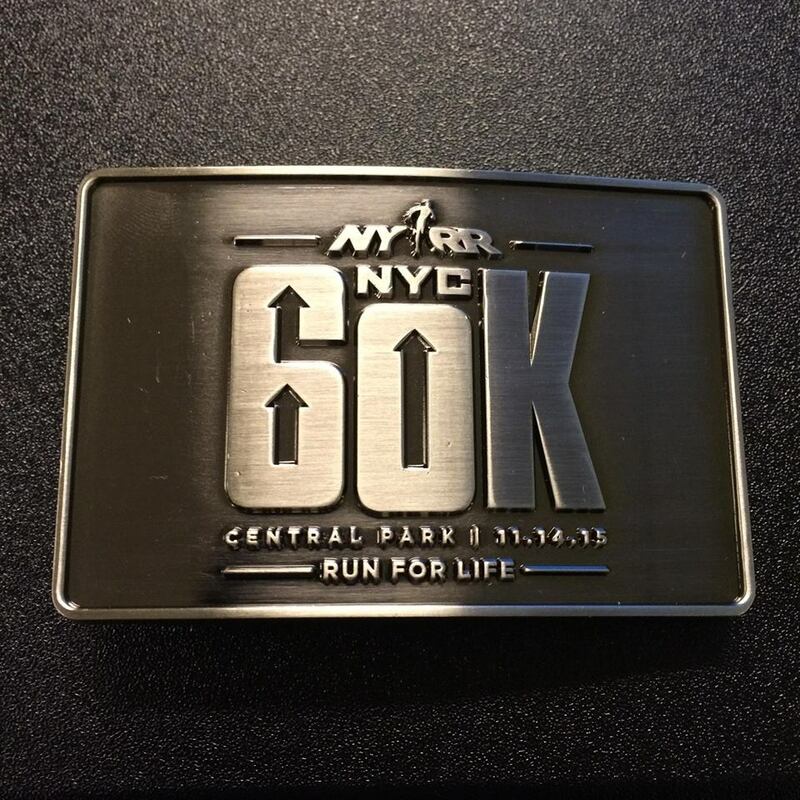 I felt physical pain during every race this fall (the Bronx 10-Mile, the Staten Island Half, and the NYC Marathon), but nothing compared to the pain I felt during the 60k. During both the Bronx 10-Mile and Staten Island Half, I was able to tolerate the pain and negative-split. The pain during the NYC Marathon, while more intense, slowed me down, but not significantly. The 60k pain, mostly after mile 30, forced me to bear down harder than ever before, and slowed my pace. 5) Mental toughness trumps pain. I almost despaired around miles 34-35. After cruising along for 30+ miles, two runners passed me, and I thought I would never return to Engineer’s Gate. I had to dig really deep to put one foot in front of the other, telling myself that I was stronger than I felt, that the pain would be over soon, and that I could trust myself. I talked out loud. I screamed a lot of “woos!” I told myself that each step felt good. I told every spectator I recognized how close I was to the finish because saying it out loud made it feel more real. I envisioned myself sprinting down the straightaway near Engineer’s Gate, and anticipated the cheers at the finish line. These positive thoughts propelled me forward. 6) On-course support is awesome. Seeing friends on the course kept my spirits high. Seeing the same volunteers at different points helped me “shorten the horizon” of the race. I thought, “In one more mile you’ll see Alison, and you can say hi get a high five.” It helped break the race into more digestible chunks. I can’t run 37.2 miles, or 50 miles, or even 10 miles, but I can run a mile and reassess. Mile by mile. Step by step. You can’t run 37.2 miles all at once. You have to do it a step at a time. 7) Camaraderie with fellow runners. Talking to other runners helped tremendously. With around 400 runners attempting the 60k, it was easy to say encouraging things to people as we ran around Central Park nine times. It’s nice to know that we’re all attempting something difficult together, and not at each other’s throats in competition. 8) Stopping for fuel/food breaks might not be necessary. If I had a “crew” helping me out during the race, I might have been able to run continuously the whole time. This might have cut 2-3 minutes off my time, enough to move up about two finishing places. That said, I appreciated the mini breaks from the running, but felt like I could have run straight had I easier access to my in-race nutrition. 9) Hard work pays off. I’ve written about this before, but I worked really hard at my running this past year, asking for help, taking advice, and staying consistent with my training. The 60k further demonstrates that commitment to improvement. 10) You must have fun. Despite the physical and mental pain, you need to enjoy the run. Multiple friends told me I looked like the happiest runner on the course. I don’t doubt it. I always try to smile at friends and spectators because I genuinely appreciate their willingness to cheers us on. On a deeper level, though, I feel so much gratitude even to be able to participate in these events. I have family and friends who support me in my efforts, and allow me to push hard every day. When I think about that, it puts my running in context and makes every step special. Plus, endorphins. Anyone else run the 60k and have some lessons learned? Lessons from other ultramarathons? I ran the NYC Marathon just under two weeks ago. I took six days off from running to allow a sore ankle to heal. I took it easy for the past six days, running about 16 miles since Sunday. I stretched, worked my core, and nailed my nutrition plan by eating all the leftover Halloween candy and pie of which a boy could ever dream. Essentially, I followed the runner’s plan in some ways, and completely disregarded it in others. Despite all that, I will run the NYRR NYC 60k, my first ultra marathon, tomorrow! I first found the 60k around the time I was accepted in the lottery for the NYC Marathon. At that time I was reading Born to Run and all amped up about ultra marathons. I kept it in the back of my head throughout the year, and decided to add it to my schedule over the summer. While I was injured and on crutches in April, May, and part of June, I doubted whether I could train for this race on only four months of training (July-October), with July being a slow return to running. After reading numerous recaps of the race, however, and realizing that many people ran and finished it after the NYC Marathon on marathon training only, and reading further that people training for a 50k often train based on a marathon training plan, I realized that I could enter the race on my limited training and treat it as an opportunity to learn about ultra running. The race also carries limited fanfare: no professional photographers, no live tracking (the race is manually scored by an NYRR worker checking off how many loops you’ve run whenever you cross the starting line), and a much more lax participation policy: anyone can hop in and run a loop or four with you. Friends, who wants to keep me company/sane? Further, NYRR allows us runners to bring a clear plastic bag filled with liquids and foods of our choice, to be placed on a “nutrition table” at the starting line and filled with whatever food we want. Nine cat hills. Yes, we get to run Cat Hill (3.3% gradient, .25 miles) nine times. As my friend Sam joked, “By the end, it’ll feel like Cat Mountain.” For real. While Cat Hill complicates the east side of the Park, the cluster of three rolling hills that I call the lesser Harlem hills dominates the northwestern corner of the loops. None of these hills are particularly long or steep. However, the constant up and down could affect pacing. Because I’ve trained in Central Park on these hills many times, and in training I tend to run the hills slowly so as to keep my heart rate down, I think I have an advantage here, and will run as if training. Nutrition nutrition nutrition. Having never run an ultra before, I have limited knowledge about how to fuel properly for the race. A friend told me to employ my marathon fueling strategy over the 37.2 miles, make sure to drink a lot of water, and to recognize that most people experience some kind of wall around miles 29-30. He recommended bringing a decarbonated Coke to slam back at this point in the race. Even though I’m going into this race at less-than-top shape (you know, having run a marathon less than two weeks ago), I have two basic goals: 1) to finish; and 2) if possible, to break five hours (an 8:00/Mile pace gets you 4:57ish). I will try to settle into a rhythm and see how I feel around the marathon point. If I’m dying, I’m happy to adjust and focus on finishing. If I’m still going strong, giddyup. And seriously, who wouldn’t want such a handsome belt buckle? I might not sound like it, but I am PUMPED about this race. I’m currently trying to figure out if I want to run a 50-miler next year, so this race will help me sort out 2016’s running goals. It also seems like it’ll be fun to run with friends as I attempt to go farther than I’ve ever gone before. And also, why not? If 300 other folks (about how many who finished last year) are attempting something awesome less than a mile from my apartment, why would I stay in bed?